I don't think my normal review will really do for this book, so I'm going to just write instead. I'm sure I won't cover anything so feel free to ask if you have any questions. 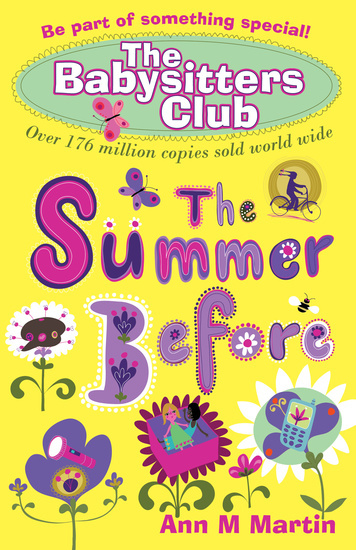 I was a huge Babysitters Club fan when I was younger, I had loads of the books and often bought one with my pocket money when I went shopping on a Saturday. They also showed the TV series on The Children's Channel on Sky - this was early to mid 90s so we're going back a bit I know! I loved Claudia the most because she was artistic and she liked odd clothes and odd earrings - something which I took to heart when I was a teenager and wore six different earrings in the three piercings I had in each ear - but I was probably more like Kristy, if I'm honest. They made babysitting look like the best job on earth, didn't they? My friend and I used to swap the books. I think my favourite was Babysitters on Board when they all go on a cruise and to Disney World. Kristy's mum has started dating Watson and Kristy doesn't like it because she's hoping her dad will come back, even though he's in California now and even though when Kristy writes to him the letter comes back undeliverable. Kristy has already been babysitting for a while and some of her charges are those that BSC readers will be familiar with, including Mallory and the other Pikes! Mary Anne is desperate to start babysitting, and eventually her super-strict dad agrees that she can, but only if she has another babysitter with her, which obviously makes her feel really babyish. She found a box of her mother's stuff in the attic and has been going through it. I don't think I realised that Mary Anne never knew her mum at all, but from this book it seems like she died when Mary Anne was born. Claudia feels like she's growing away from Kristy and Mary Anne because she's interested in boys and fashion and they aren't. She meets a boy called Frankie at her birthday party and hangs out with him all summer, barely seeing her friends. Stacey got her diabetes diagnosis when she was in the 6th grade, but for some reason didn't tell any of her friends, including her BFF Laine. She's living in New York with no friends and feeling very alone. She's quite looking forward to moving to Stoneybrook, therefore, even though she'll miss all the kids in her building that she babysits for. See, it all happens! I felt like this was a very cute prequel to the series and like it would have brought a whole new generation of girls to the BSC. I'm giving it eight out of ten because it made me remember how much I loved those books! So many memories of reading these books when I was younger!